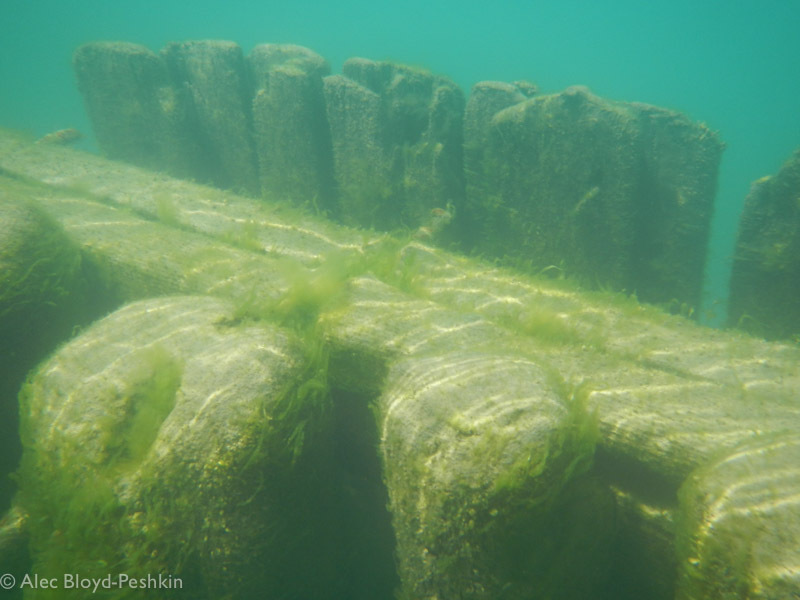 Taking a photo below the surface near the breakwater at 12th Street Beach. A few months ago, the breakwater at 12th Street Beach was barely below the surface. Today, we had at least 18 inches of clearance. According to the US Army Corps of Engineers, water levels in Lake Michigan are up by a foot and a half. The June 27 level was 577.68 feet, up from 576.19 on March 1. Water levels were historically low at the start of this season due to last year's record heat and drought, combined with this past winter's lack of snow and ice. This spring's record-breaking rain has been making up for those losses. New course offering: Open water journeying! Journeying along the scenic Chicago shoreline. 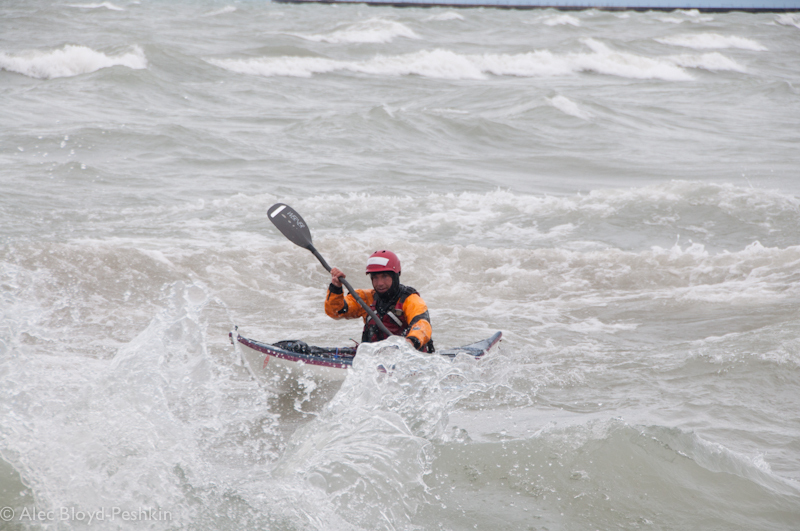 This has been a busy paddling season, between the private lessons and club trainings we've offered, the coach trainings we've participated in, and our personal paddling adventures. 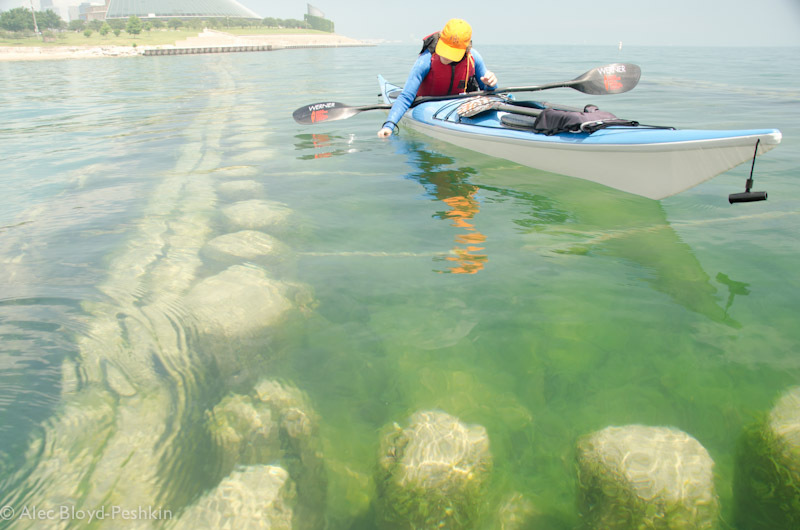 This Saturday, Have Kayaks, Will Travel is offering an open-water journeying course, and spots are still available. solve problems and make decisions as needed to keep a group safe and have fun on the water. 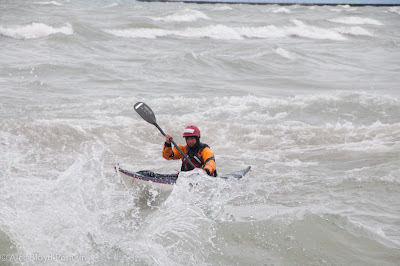 We're going to coach these skills during a fun journey on the Chicago River, through the locks, and on Lake Michigan (though the exact route will depend on conditions that day). To register or for more information, contact us at kayak.bp@gmail.com and please include a phone number so we can call you back. on waves cresting and crashing. I hear you, I get it. In that case, get out! and have so much fun. hanging in the back yard. to get to the car. for first aid and repairs. and the water and dirt. with you wearing a skirt. Hang out with your kids. your children still love you. You’re the dad of their dreams. 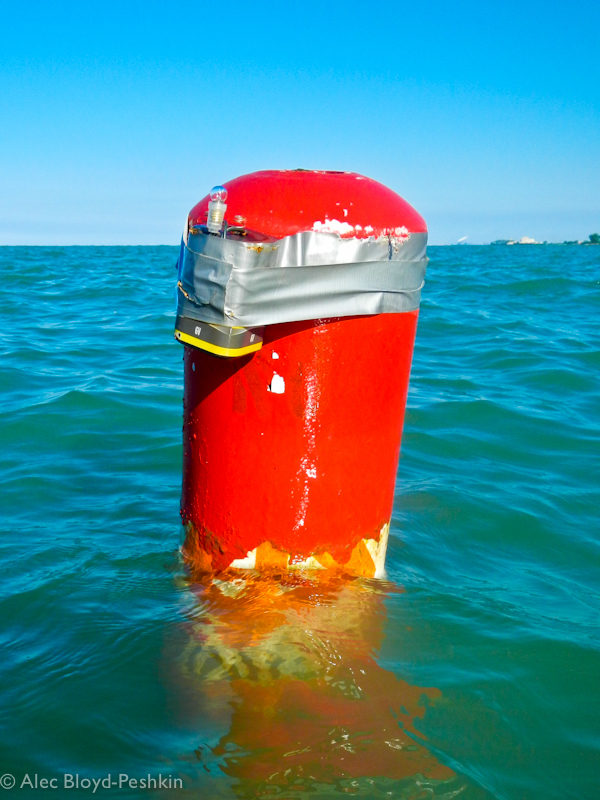 A buoy outside of Jackson Harbor in Chicago. A little bit wonky, but we guess it works! Forget tuxedos and gowns. 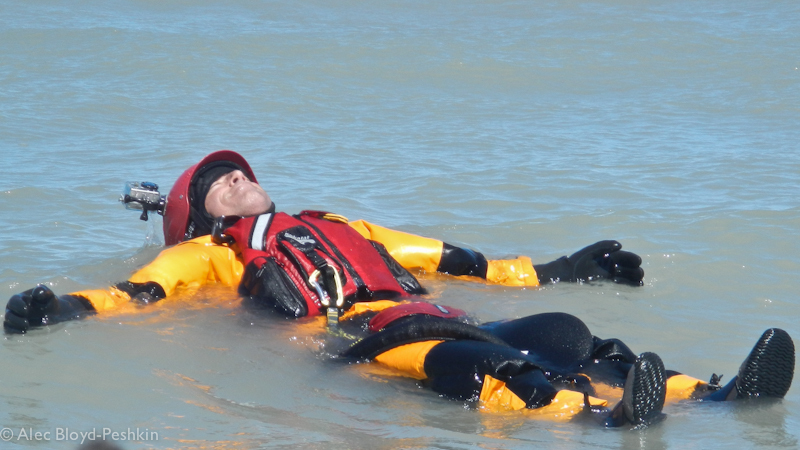 Our drysuits are our most treasured (and most expensive) garments. Treating them well can lengthen their working lives and ensure that they perform their jobs perfectly. 1. Keep your drysuit out of direct sunlight whenever possible. UV degrades both Gore-Tex and latex, shortening the life of the fabric and the gaskets. 2. Avoid insect repellent and sunscreen. DEET is particularly destructive of latex gaskets; sunscreen is also rough on them, so apply it at least 15 minutes prior to putting on your drysuit to allow the sunscreen to soak into your skin. When you reapply, avoid getting it on the gasket. 3. Rinse your drysuit in fresh water, with the zipper closed, after paddling in salt water. Hang it to dry on a wide hanger with the zipper open one or two inches. 4. Clean your drysuit with fresh water. If it smells bad, use a drysuit shampoo or a gentle, bleach-free laundry soap. 5. Never put your drysuit in a top-loading washer; the agitator may rip it. 6. Lubricate metal-tooth zippers with hard wax; use non-wax lubricants on plastic zippers. Plastic zippers should be lubricated every other time you wear your drysuit. 7. Protect drysuit booties by wearing socks and being careful not to walk or stand on surfaces that might damage them while you're changing. 8. Transport your drysuit loosely rolled with the zipper open one or two inches. 9. Store your drysuit in a dry area on a wide hanger with the zipper open one or two inches. 10. When the DWR wears out (and it will! ), try ironing the Gore-Tex fabric on the nylon setting to reactivate it. If you decide to re-waterproof it, use a spray-on product, not a wash-in product, so that it doesn't get on the inside your drysuit. Dry it with an iron (on the nylon setting) or a hair dryer; never put your drysuit in a clothes dryer. Routine maintenance, such as gasket replacement, can be done at home. Other repairs, such as leaks and tears, should be done by the manufacturer. Please excuse our prolonged posting intermission. Lots is happening behind the scenes. This blog will soon be migrating to a new domain. 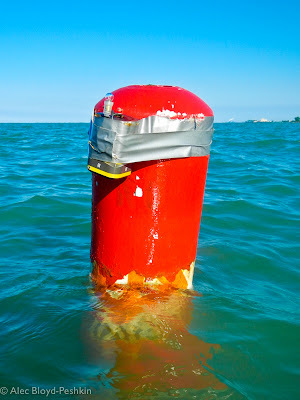 Our friend, the paddler and graphic designer Chris Hoffman of Faucethead Creative, is building us a new website. And our former student, the talented Flo Katzenbach, has created our new logo. We've been paddling, coaching and training. We have new sponsors and are about to get new boats. All this activity has kept us offline, but we'll be back soon.